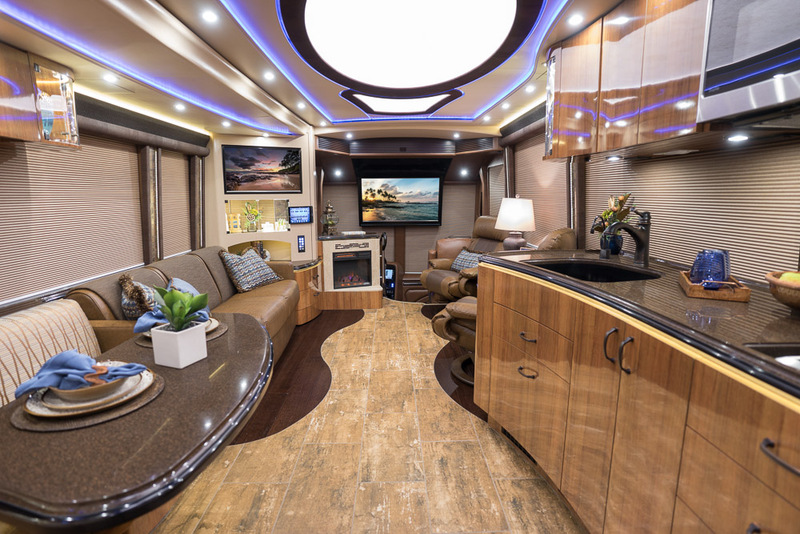 The owners of Marathon Show Coach #1274 were looking for something 100% luxe, yet casual enough to make their guests feel completely at home. Their H3-45 features rich tones of chocolate, copper and bronze inside and out. Sparkling mosaic tile adorns the entry step risers, a hint of what awaits inside. 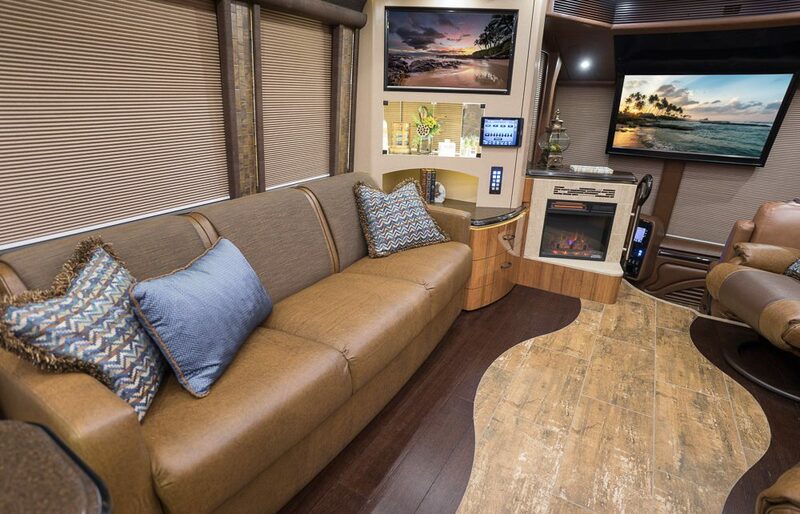 With stranded bamboo wood accents and easy-to-care for heated porcelain floor tiles with a rugged, hand-scraped barn wood look, this carpet-free luxury RV was perfectly designed for endless days and effortless cleanups, even when traveling with pets or children. The refined salon streams with natural light that clearly conveys that happy days are here as the vein-cut travertine fireplace with mosaic glass accent provides a charming glow, while the warm, neutral walls with teak cabinets and dark polished countertops provide the ideal color palette for the sapphire blue accents. 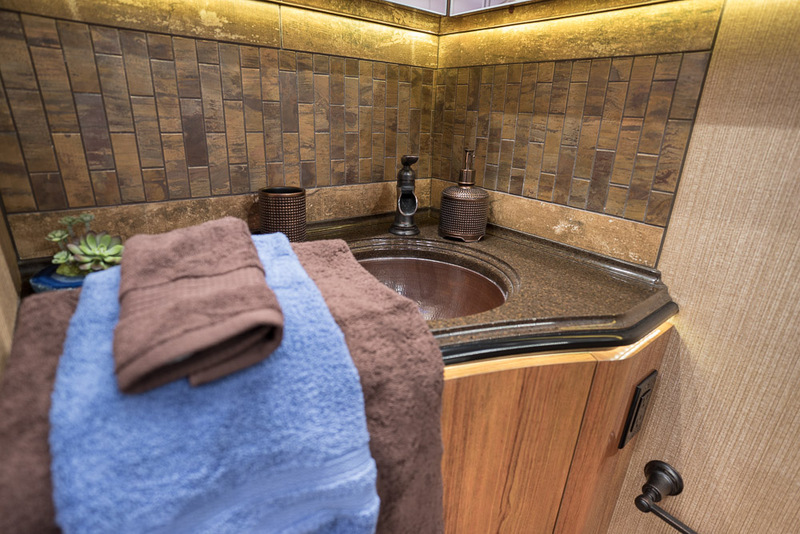 The antiqued copper tile in the backsplashes and vanity sinks provides a warm, down-home flair rarely utilized in partnership with such opulence. Oil-rubbed bronze plumbing, sconces and pulls coordinate with counters, flawlessly pulling everything together. When it’s time to freshen up, the framed feature of glass mosaic tile inspires as it shimmers in the over-sized shower, made complete with the rain showerhead, handheld showerhead, spa seat and self-cleaning pocket door. As night falls, the grand master suite is the epitome of luxury with its regal-looking gold and dusk custom-designed comforter. 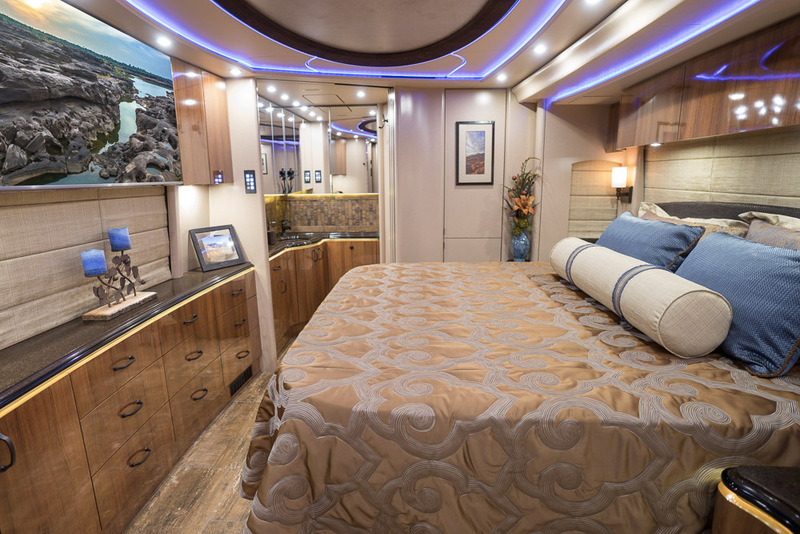 The upgraded, adjustable king bed is ideal for watching favorite programming on the 49-inch Samsung TV; however, for avid travelers, it also allows a comfortable pathway to the rear of the coach even with the slides in. Flawlessly combining old-world charm with modern-day comforts, dressed in warm neutrals with an emphasis on copper and bronze, Marathon Show Coach #1274 is a study of timeless design using contrast as an eye-catching key element. 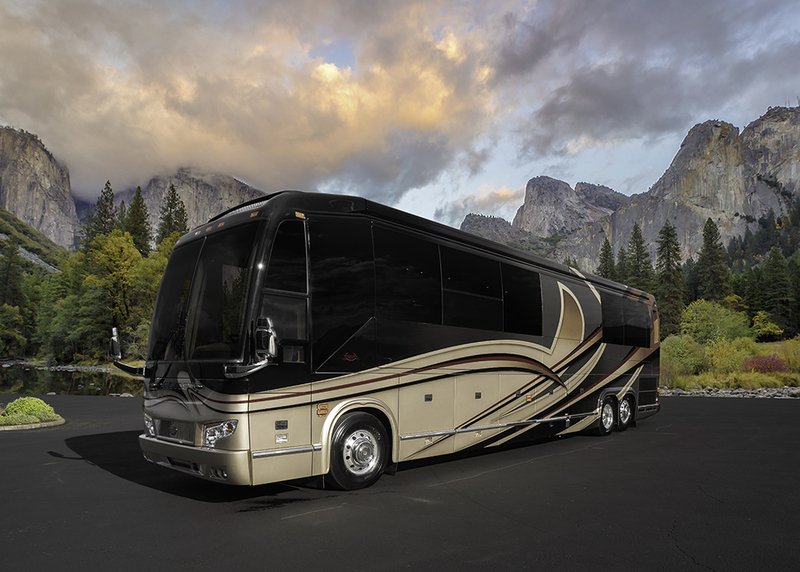 If you’re ready to rekindle that childlike wonder as the road stretches before you and the journey becomes a series of endless opportunities from the cockpit of your own luxury RV, call any of our three locations to find the coach for you.